Without doubt safety for Direct Wind Services is always a priority! We consistently provide staff with on the job training and guidance, ensuring staff development, quality assurance and continuous improvement are paramount. All to provide a safe and healthy working environment for our staff and customers. We ensure the use of any personal protection equipment and fall protection is of the highest qualify and compliant with all our customer requirements. We therefore only work with safety equipment certified and produced according to the Australian and New Zealand standard. In example, helmets certified to AS/NZS1801:1997 and reliable harnesses are certified to AS/NZS 1891.1. ​We recognize the importance of an efficient management system this to enforce our commitment to occupational, health and safety. ​We are proudly using the cm3 platform, a leading OHS/WHS management system. This management system has been developed so that our customers can be confident that the contractors they engage have OHS/WHS systems and processes in place for working safely. 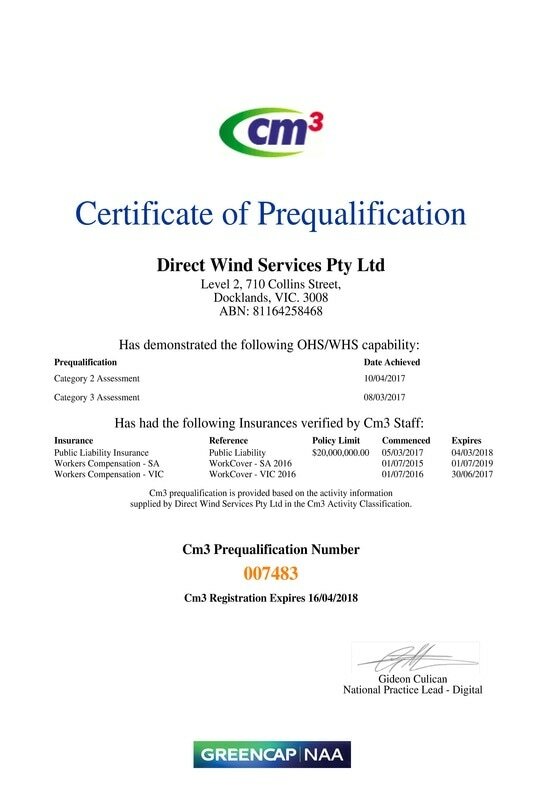 ​Cm3 assists Direct Wind Services with our legislative duty of care to ensure we have the processes in place to safely conduct work along with improving and managing our health and safety requirements.